Junie B. Jones: The Musical - May 3, 2019 to May 4, 2019 - Oak Park-River Forest Chamber of Commerce, IL ? 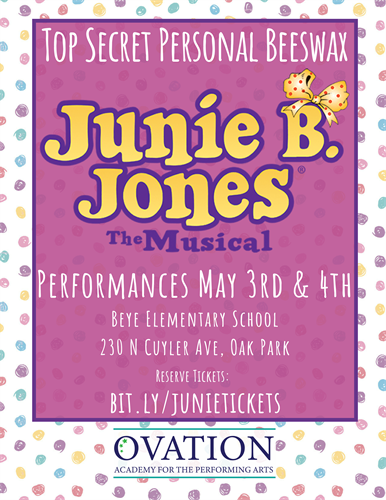 Oak Park, IL – Ovation Academy for the Performing Arts will present Junie B. Jones - The Musical, taking place at Beye Elementary School on May 3rd and 4th. Ovation Academy is proud to bring Junie B. Jones to Beye Elementary School. Junie B. Jones run for approximately 45 minutes. Tickets are $7 and can be purchased at bit.ly/junietickets. We will be selling concessions before the show, as well as Junie B. Memorabilia. “The productions are amazing and the kids learn, grow and have fun! It never ceases to amaze me that they can take 20-30 kids (rambunctious, energy-filled kids) and make a first-class production in just a handful of weeks.” - Yelp, Pam B.
Ovation Academy provides the highest quality of training and instruction in the arts, encouraging excellence, enthusiasm, professionalism and passion in our students. Our Broadway Academy shows, like Junie B. Jones, highlight just a fraction of what we do at Ovation. Visit www.ovationacademy.org to learn more.